Charm your dear ones in all cities in India by sending this fresh fruit basket through GiftsAcrossIndia.com. The cane basket comes 2 Kgs Fresh Fruits in a cane basket ( 250 gms apple , 250 gms black grapes , 1 pineapple , 250 pears , 6 oranges ). Your dear ones will enjoy having these juicy fruits. 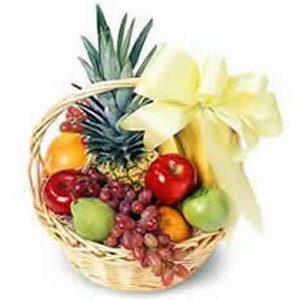 Moreover, you can send other Gifts across India with this fruit basket.